While our show season is still underway, with Rick and Jose preparing for the SCI Show in Monterey, Mexico, we wanted to share some great news from Africa! 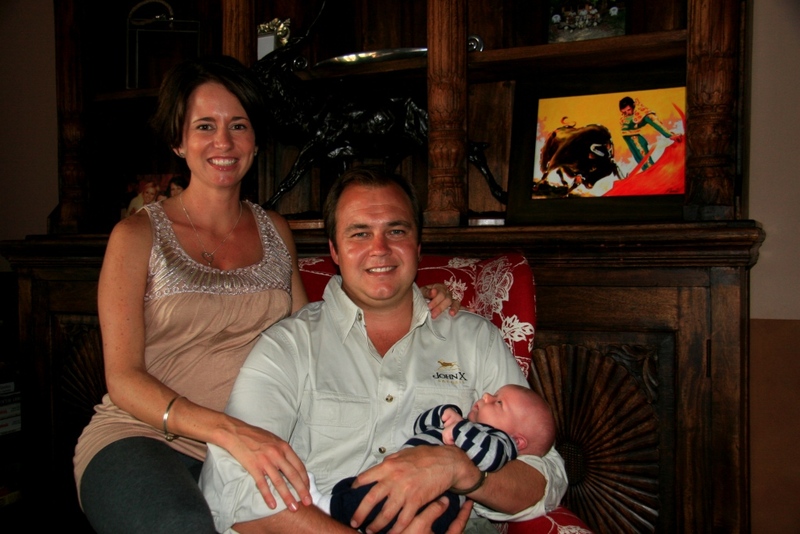 On Thursday, 24 January 2013, Brett van Zyl was born to proud parents Carl and Trish. Since then Trish and Brett were able to come home and have been home for just on two weeks now. All is going well and we’re told Brett will be ready to guide come 2034 – seems to us the little fellow has taken a liking to the safari world already, how else can one explain his peaceful nights with the resident Lion keeping all up except him! To those who are yet to secure their next hunt with John X Safaris, here’s a quick reminder of our remaining 2013 Show and Travel Schedule. If you or any of your friends are interested in meeting with us, please drop us a line, we’d be glad to fit you or them into our schedule. We look forward to seeing you on our travels or hearing from you on mail at hunting@johnxsafaris.co.za . For more information on our hunts and current updates about John X Safaris; follow us on Twitter, connect with us on Facebook and visit our website!